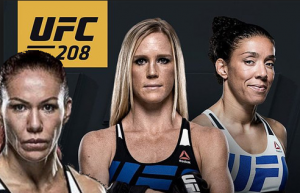 UFC 208 Holm vs de Randamie: What!! Is this Weird or What? Women’s MMA history is being made yet again, with the inaugural woman’s feather weight championship bout between highly decorated strikers Holly Holm vs Germaine De Randamie at UFC 208! WHAT!! Is this weird or what?? Isn’t Cyborg the Invicta FC champ and the most dominate female fighter on the planet! Isn’t she the pound for pound number one fighter in the 145 lb division? She hasn’t lost a fight since 2005, winning her last fight against Lena Lansburg on Sept 24th 2016 at UFC Fight Night 95 in Brazil. So why in the world are these two headlining for the “first” UFC feather weight title bout? Sure on paper when you look at both fighters its an awesome match up. De Randamie is a 10 times undefeated Muaythai/kickboxing world champion while Holm is 24 times world title boxing champion. So we’re looking at a potential rock em sockem sluggfest. But why a title fight between these two? After all, Holm is coming off back to back losses, one defending her title against Meisha Tate in UFC 196 last March and the other to Valentina Shevchenko last July. DeRandamie has had 2 recent wins in the UFC, last year against Anna Elmose and the year before against Larissa Pacheco but lost in 2013 to current UFC bantam weight champ Amanda Nunes. The UFC seemed to think this was ok but still WHY wasn’t Cristiane Justino on this card? Doesn’t it make more sense that she be a contender on UFC 208 for the feather weight title and a huge pay-per-view headlining fight for 2017? In response, Dana White made it clear he offered Cyborg three fights which she turned down. 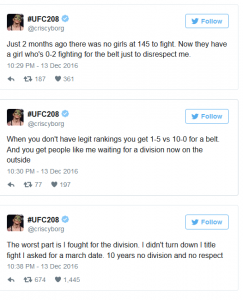 But Cyborg stated she only wanted the title fight pushed out till March 2017. Soon after the story took a turn, when Ariel Helwani tweeted Cris Justino busted USADA violation. To many, myself included…NOOOO Not AGAIN!! Cris Cyborg shelved again due to a flagged out-of-competiton drug test! Dana White stated that her refusal to take any of the fights he offered made sense to him now. However, Cyborg revealed in a statement that she had been taking a diuretic called spironolactone which was administered by her physician after she underwent extreme weight cuts in 2016. This makes sense when you see what she went through for that 140 lb weight cut she did. In her defense she cut weight 3 times in 8 months during 2016 competing twice at 140lbs. George Lockhart her nutrition coach put her on birth control pills before her last fight…to help with mood swings, weight increase during her period and ease the weight cut process for her. Cyborg argued with Lockhart but took the birth control pills anyway, to serve as a natural diuretic to help her body shed weight while water and sodium intake was limited. It seemed to help for her fight against Lansberg. She made weight but at what cost? Cyborg cut from more than 165 lbs down to 140lbs in her last two UFC bouts. That’s 25 lbs of weight cutting and more than the UFC’s new weight cutting rules that a fighter must weigh no more than 8% above her designated weight class on fight week, which is usually at least five days before she enters the octagon. The question now remaining is that if, Aldactone (spironolactone) is banned in and out of competition under the UFC’s anti- doping policy and the WADE code because its considered to be a masking agent for anabolic steriod use, why was Cyborg really using it after her last fight? It’s known to increase urine volume which can help dilute doping agents in their metabolites in testing. It is also known for treating diuretic-induced low potassium (hypokalemia) even though it is also used to remove excess fluid from the body in in patients who have congestive heart failure, cirrhosis of the liver, and kidney disease. Just the fact that she’s had to resort to be on this drug after her weight cut should scare you and bring awareness to the dangers of excessive extreme weight cutting fighters like Cyborg are expected to endure in a short amount of time. Regardless, sadly Cyborg was busted and is facing a suspension from 1 to 2 years for this violation or she will have to prove the administration of spironolactone was an emergency. She has appealed the violation stating that the drug was for therapeutic use and exempt (TUE) and is fair in her situation. During that time your guess is as good as mine as to what will happen in the new feather weight division. Cyborg without question is glad the UFC has created the 145lbs division and looks forward to fighting for the belt. Its simple to see she wanted to take the fight’s that White offered but with a body that was recovered from two extreme weight cuts and ready to compete. If cleared of the violation it is likely that she will be the first opponent for the winner of UFC 208. Then you guessed it, Amanda Nunes made it clear she’s out for a 2nd belt wanting to pull a “McGregor”!